The bottle is an oval flattened flask form with a particularly wide neck hole and narrow neck walls. It does not have a stopper. 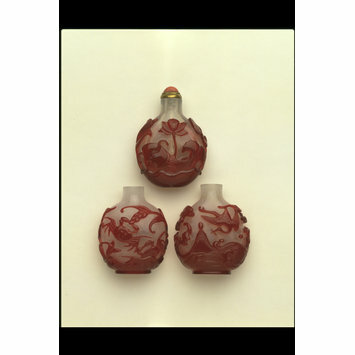 It is made of white semi-opaque glass with an overlay of red glass carved in relief. The decoration depicts two crabs among rushes, one seizing a plant with its claws. On the reverse is a crab seizing a plant with its claws, a lotus leaf and a bubble. A continuous lotus leaf rises from the base of the bottle, forming the sea bed and suggesting waves. The high foot is formed by the overlay with angular indentation underneath. The decoration forms a complex pun: er jia chuan lu, ('Two suits of armour [crabs] through the rushes') also means 'First place in the Second Class of the jinshi degree' (Zhongguo Jixiang Tu'an, p. 478). The carving is of good quality.